The International Symposium on Open Collaboration | The conference and community for open collaboration researchers and practitioners worldwide! Bruce Perens gives keynote on Open Source in Space @ OpenSym 2019, see Keynotes for details. Deadline for submission is approaching, but you can still submit your papers (see Call for Papers). We are very excited to announce Andrew Katz as a keynote speaker at OpenSym 2019! For further details, see Keynotes. The submission site for OpenSym 2019 is now open. We are extremely excited to announce Bruce Perens as a keynote speaker at OpenSym 2019! Welcome to contribute to OpenSym 2019! The Call for Papers has now been published here. We’d like to thank all the participants of OpenSym that joined us in Paris for this 2018 edition! We are looking forward to seeing you all next August in Skövde (Sweden) for OpenSym 2019, the 15th International Symposium on Open Collaboration. You can find all the presented paper in the proceedings page, and some recordings in the keynote speeches page. Information Systems College of Information Science & Technology, University of Nebraska Omaha. Aaron Halfaker (Wikipedia Foundation) and Stuart Geiger (UC Berkeley), for a discussion about qualitative and quantitative studies and Wikipedia. wikis and open collaboration, and Wikipedia and Wikimedia projects. Submitted papers should present integrative reviews or original reports of substantive new work: theoretical, empirical, and/or in the design, development and/or deployment of novel concepts, systems, and mechanisms. Research papers will be reviewed to meet rigorous academic standards of publication. Papers will be reviewed for relevance, conceptual quality, innovation and clarity of presentation. The call for papers for the doctoral symposium can be found at our website. The doctoral symposium is lead by Björn Lundell, University of Skövde. The call for papers for the doctoral symposium can be found at our website. Submission deadline is April 15th, 2018. The call for submissions to the community track can be found at our website. The submission deadline is April 22nd, 2018. 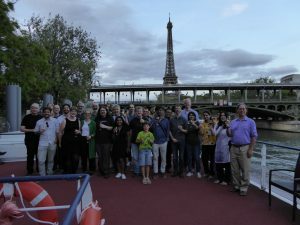 OpenSym 2018 will be held in Paris on August 22-24, 2018. Research and community presentations and performances will be accompanied by keynotes, invited speakers, and a social program in one of the most vibrant cities on this planet. The 14th International Symposium on Open Collaboration (OpenSym 2018) is the premier conference on open collaboration research and practice, including open source, open data, open science, open education, wikis and related social media, Wikipedia, and IT-driven open innovation research. OpenSym is the only conference that brings together the different strands of open collaboration research and practice, seeking to create synergies and inspire new collaborations between people from computer science, information science, social science, humanities, and everyone interested in understanding open collaboration and how it is changing our society. This year’s conference will be held in Paris, France on August 22-24, 2018. A Doctoral Symposium will take place on August 21, 2018. FLOSS development processes, such as code reviews, joining process, etc. Development of new knowledge or products (e.g. Maker Spaces), collecting data (e.g. Citizen Science) or discussing political topics (e.g. e-participation). Paper Presentation: OpenSym 2018 will be organized as a one track conference in order to emphasize the interdisciplinary character of this conference and to encourage discussion. Submission Deadline: The research paper submission deadline is March 15th 2018. Submitted papers should present integrative reviews or original reports of substantive new work: theoretical, empirical, and/or in the design, development and/or deployment of novel concepts, systems, and mechanisms. Research papers will be reviewed to meet rigorous academic standards of publication. Papers will be reviewed for relevance, conceptual quality, innovation and clarity of presentation. Paper Length: There is no minimum or maximum length for submitted papers. Rather, reviewers will be instructed to weigh the contribution of a paper relative to its length. Papers should report research thoroughly but succinctly: brevity is a virtue. A typical length of a “long research paper” is 10 pages (formerly the maximum length limit and the limit on OpenSym tracks), but may be shorter if the contribution can be described and supported in fewer pages—shorter, more focused papers (called “short research papers” previously) are encouraged and will be reviewed like any other paper. While we will review papers longer than 10 pages, the contribution must warrant the extra length. Reviewers will be instructed to reject papers whose length is incommensurate with the size of their contribution. Papers should be formatted in ACM SIGCHI paper format. Reviewing is not double-blind so manuscripts do not need to be anonymized. Posters: As in previous years, OpenSym will also be hosting a poster session at the conference. To propose a poster, authors should submit an extended abstract (not more than 4 pages) describing the content of the poster which will be published in a non-archival companion proceedings to the conference. Posters should use the ACM SIGCHI templates for extended abstracts. An example of a poster abstract can be found here. Reviewing is not double-blind so abstracts do not need to be anonymized. Response from authors: For the second time at OpenSym, authors will be given the opportunity to write a response to their reviews before final decisions are made. This should be treated as an opportunity to correct any mistakes or misconceptions in the reviews as well as to propose minor changes that the authors can make during the two weeks between notification and the camera-ready deadline. The general chairs of the conference are Nicolas Jullien and Olivier Berger, IMT, France. Feel free to contact us with any questions you might have at info@opensym.org. The program chair is Matt Germonprez (University of Nebraska at Omaha). The Organizational Chair is Ghislaine Le Gall (IMT Atlantique). Associate Chairs and program committee members will be listed here as the committee is finalized. Defined as “collaboration that is egalitarian (everyone can join, no principled or artificial barriers to participation exist), meritocratic (decisions and status are merit-based rather than imposed) and self-organizing (processes adapt to people rather than people adapt to pre-defined processes)”, we are seeking community contributions that best exemplify this definition of open collaboration. Submissions should follow the standard ACM proceedings format. All papers must conform at time of submission to the formatting instructions and must not exceed the page limits, including all text, references, appendices and figures. All submissions must in PDF format. As long as it is April 22nd, 2018, somewhere on earth, your submission will be accepted.